The entire growing season we use our licensed kitchen. In the winter time not so much, just the fridge for the eggs. There is a time in the really cold, really dark part of the winter where most things really grind to a halt. And egg production slows. For a bit we turned the water off, saving the pump and hot water heating. And then *boom, eggs aplenty. 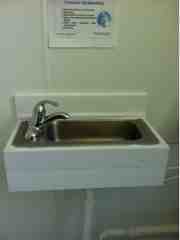 Water needed for hand washing. And no hot water. Water, but mostly cold. Discussions of removal, return, replacement of hot water heat system.